WOW!OMG! I finally received two of the birdhouses I ordered (Ordered the Rockford and Peterson). I just didn't think this kind of workmanship still existed. I became emotional upon seeing these beautiful bird houses, - as if they were made only with me in mind. My two birdhouses were worth waiting for. Thank you from the bottom of my heart. The birdhouse arrived safely (Ordered the Rockford). I can't tell you how thrilled we are with the superior craftsmanship and all of the creative design touches. You did an outstanding job. It's already installed and we love looking at it in the yard and the birds are also checking it out. You can count on us for future orders as we have a few gifts in mind. It's been a pleasure ordering from you. 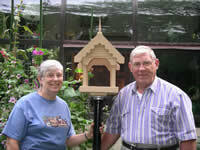 "Thank you for the great job in building this somewhat large birdhouse. I have it painted and on its pole in our backyard. 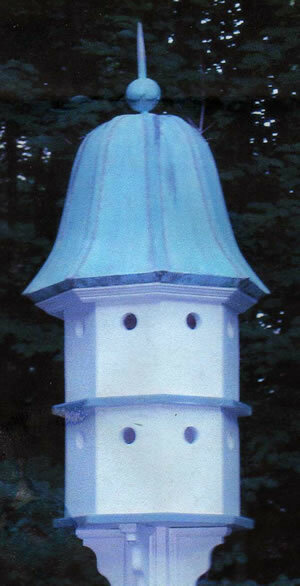 I was able to use the copper cuppulo roof from our old bird house that rotted out. You do high quality work at a great price. The craftsmanship is excellent! Thanks a lot, K. L."
"... I knew I had to have that blue bird house. So I had my son order it for me. Well it arrived this past weekend and I got it up. I wanted to let you know what a wonderful satisfied owner of your grand work I am. Long and short of my precious blue birds, they took to your wonderful craftsmanship the minuet the blue bird house went in the air. I know my blue bird was asking me... "Is this for me?" I am very proud of your craftsmanship and what you do for our environment & Mother Nature. I am sure in the future my yard will need an addition from your fine works of art! A proud owner of an original Bird Houses by Mark!" "I just wanted to let you know how much I appreciated all your help! not many people would have taken the time to help someone who did not know how to send PayPal. I do not know how old you are, but God bless! Thanks" P.W., TX. "YOU DID AN AWESOME JOB ON THE BIRDHOUSES! THANK YOU!!!!!" D.M., PA.
(custom built 5 bluebird houses). "Mark - Got the bird feeder yesterday and it is gorgeous!! My principal loved it and can't wait to get it up in his yard. I appreciate all the extra effort you put into this order. Thank you so much and I look forward to doing business with you again." J.C., CA (ordered gazebo bird feeder). "Mark, Yes I did recieve my bird feeder [Cedar Fly Thru] and I love it! Thank you" P.A. Carrollton, Tx.